We’re proud to offer our Stand Alone Automated Measurement (SAAM) solution for applications that require the highest level of inspection detail, all while maintaining an ease of use that allows everyone on your production floor to operate it safely and efficiently. The streamlined human-machine interface allows your operators, managers, and engineers access to quick and repeatable measurements. This creates a package that allows the inspection task to be brought straight out to the production floor, creating more efficiency for your overall operations. 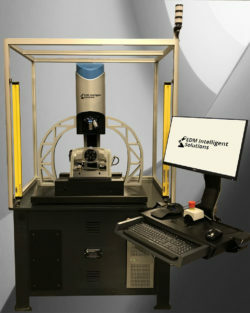 The SAAM-100 automated metrology system from EDM Intelligent Solutions is geared towards applications that require the highest level of inspection detail while still maintaining an ease of use that allows everyone on your production floor to operate it safely and efficiently. The streamlined human machine interface as well as total access control allows operators, managers, engineers and administration managed access to quick, repeatable and traceable measurement all in a package that allows the inspection task to be brought out to the production floor. Capable of automatic tending by a FANUC or Mitsubishi robot. The SAAM-200 automated metrology system from EDM Intelligent Solutions is geared towards applications that require the highest level of inspection detail while still maintaining an ease of use that allows everyone on your production floor to operate it safely and efficiently. The streamlined human machine interface as well as total access control allows operators, managers, engineers and administration managed access to quick, repeatable and traceable measurement all in a package that allows the inspection task to be brought out to the production floor.